Driving games are great, but they have lacked one important thing. Beer. 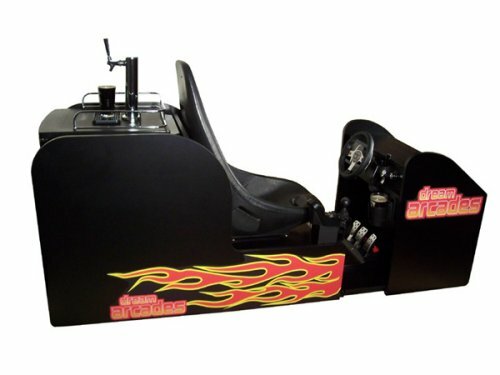 The Octane 120 Beer Arcade is a fully functioning gaming PC, with full driving controls, a built-in projector so you can play BIG and a dozen driving simulations pre-installed. So that takes care of the driving. What about the drinking? Well, they have that covered too, for better or worse. Behind the seat, there is enough room for half a barrel of beer, with a tap in the middle of your controls, so that you can pour a fresh beer while driving. Check out the Official WWE All Stars Arcade BrawlStick for Xbox 360 and PS3. Now you can lay the smack down with an arcade style joystick. This BrawlStick from Mad Catz features a redesigned ball top joystick and high quality concave action buttons for gaming precision. 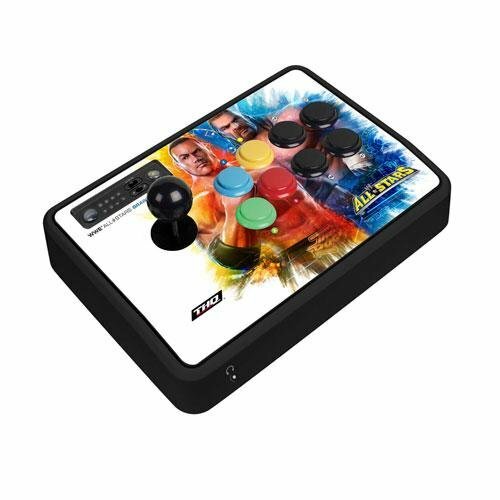 Wrestling fans will love the graphics and you can get right into the game without having to manually configure the buttons since Mad Catz has already pre-programmed it. It will cost you $79.99. This tabletop arcade machine comes from Europe and was designed to be a coffee table/ arcade system. That’s what makes it a millennium table I guess. We need games in our tables in this millennium, otherwise it’s just a “so last century” table. The arcade system holds 60 classic games including Space Invaders, Pac-Man, Asteroids etc. 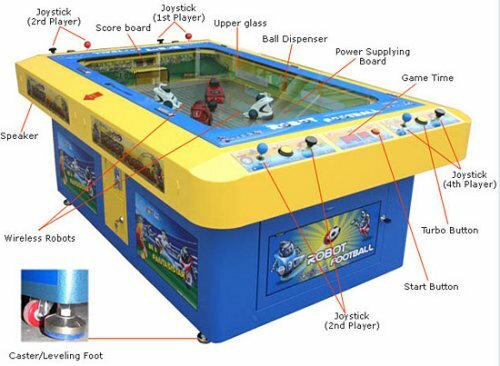 It features a 19″ LCD, fire buttons and a joy stick on both sides of the table for two player games. The Millennium Table retails for £1900.00 (or about $3010). We could all use a retro arcade table that will also entertain our guests and this one is pretty awesome. The Pac Man Arcade Machine Cocktail Table comes with 13 classic arcade games, which include Pac-Man, Ms. Pac-Man, Galaga, Rally X, Mappy, Xevious, Galaxian, Pac-mania, Rolling Thunder, Bosconian, Dragon Spirit and Galaga 88 and Dig Dug. Those are some classics. And if you want to make some money, just charge them .25 to play each game. Though that might be a good way to make sure these guests never come back. 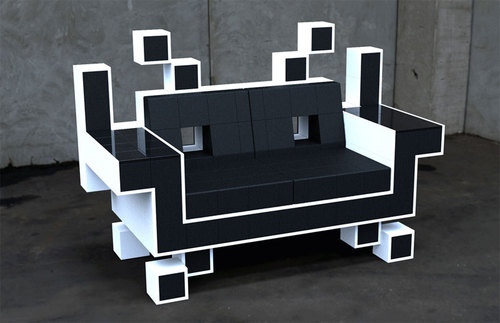 This Space Invaders couch is awesome, even if it does look uncomfortable. It’s the perfect seat for playing the classic game and once you win, you can consider it your throne as you will have vanquished your alien foes. Sadly, this sofa will likely never get made. Only myself and two other people would buy it. It was created by designer Igor Chak. It probably folds up and eats you if you lose the game. 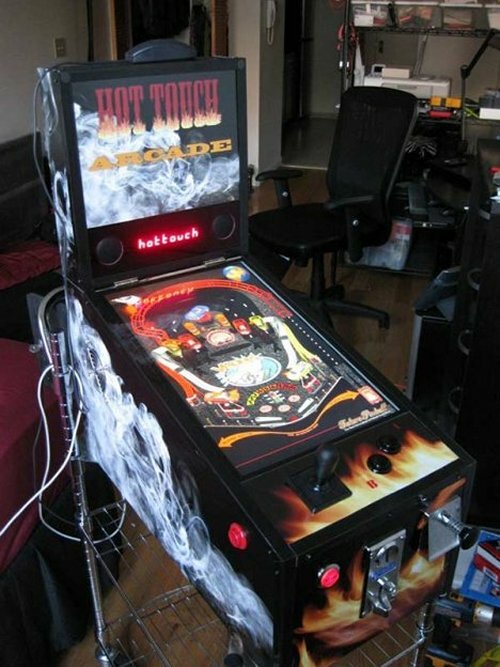 Pinball emulators are usually running on a PC, but if you are the crafty type, you can do what this guy did and create a 1/3-scale pinball machine called the Hot Touch Arcade. The emulator is in the pinball machine itself and powered by an Intel Atom processor. There’s also an NVIDIA graphics card, and it runs on Windows XP. The actual pinball game area is displayed on a 19-inch 16:9 LCD display, and it includes a physical shooter, flipper buttons, and a coin slot. Pretty nice! New Xbox 360 Arcade in August? As far as we knew, the $199 Arcade version of the new Xbox 360 would be coming in this fall. But now, Amazon Germany has posted a page with some more details. Apparently it will come with 4GB of storage (Maybe on a flash drive) and arrive on August 20th. Even if that’s accurate for Germany, that doesn’t tell us what will happen in the US market, but it’s looking like we will see the new Xbox Arcade at least before Thanksgiving and maybe even this August. 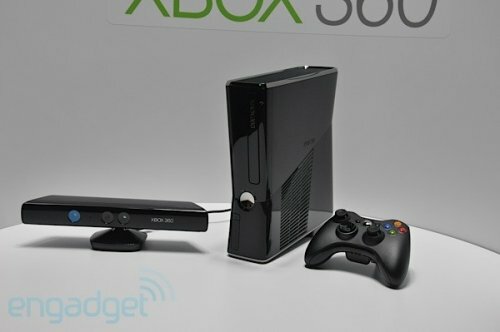 We already heard that the legacy Xbox 360 consoles will have a price cut with the introduction of the new Xbox 360 slim. And now Walmart wants to tempt you with a Father’s Day bundle. 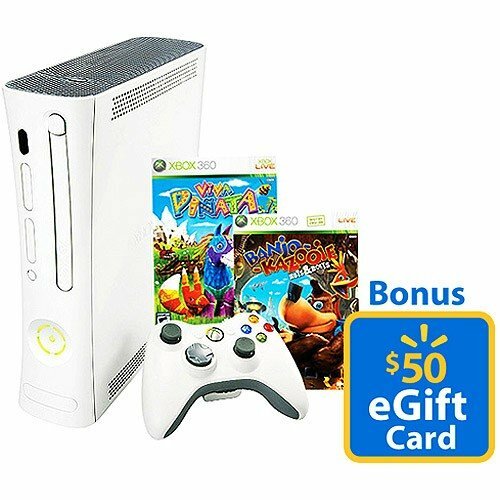 Until June 20th, you can purchase a newly priced $149 Xbox 360 Arcade and get a $50 Walmart eGift card. The card is only usable on Walmart.com and Samsclub.com. You also get two free games (Banjo-Kazooie: Nuts & Bolts and Viva Piñata), a wireless controller, and 256MB of memory included in Microsoft’s Spring Bundle. So you can get a console that cost $199 a few days ago for $99. If nothing else has sold you on the iPad, this thing here sure makes it tempting. 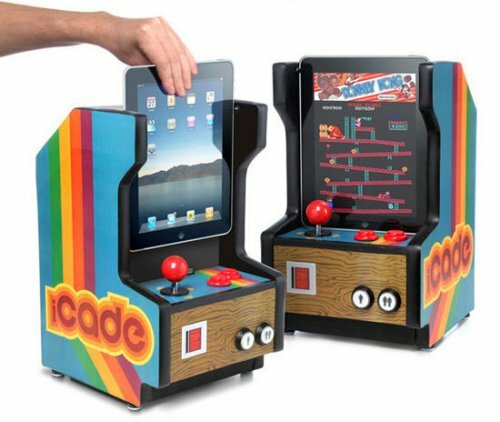 The iCade turns your iPad into a mini arcade cabinet. It’s one thing to play an arcade game on your iPad, it’s another to slide that iPad into the iCade and relive the good old days. In miniature size anyway. The iCade will cost you $150. Pretty awesome. Overpriced, but then many say that about the iPad too. You decide. We like it. 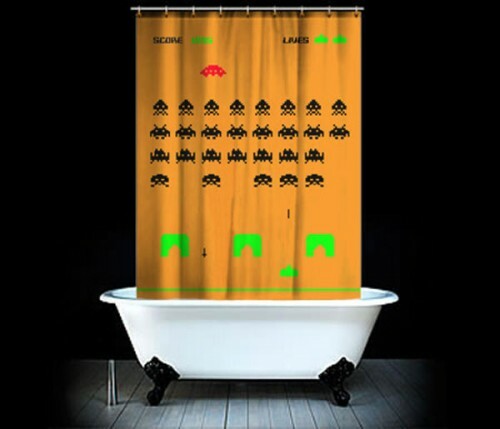 We love Space Invaders and if we could we would have our human women wear tights with the alien invaders on them. Well, now we can. These would make a great Valentine’s Day gift for that geek girlfriend. They’re designed and distributed from Australia by Black Milk Clothing and they not only have the classic aliens from the game, they also show off your figure. $80 seems a bit steep, but putting a classic arcade game on your cameltoe? Priceless. There’s no arguing that Tetris is a true classic. We’ve seen countless interpretations of the game. 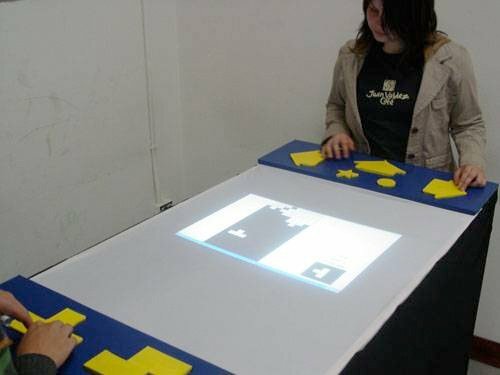 Now we have a two-player Tetris table that looks like a whole lot of fun. The idea is that one of the players gets to choose the pieces to send down to the other player, which makes it more difficult to get the right pieces to fit. Talk about frustrating! Still, it sounds very intense. We can only imagine that soon there will be some serious Tetris wars fought on this thing tournament style. Atari has something new to offer gamers. Actually something old. 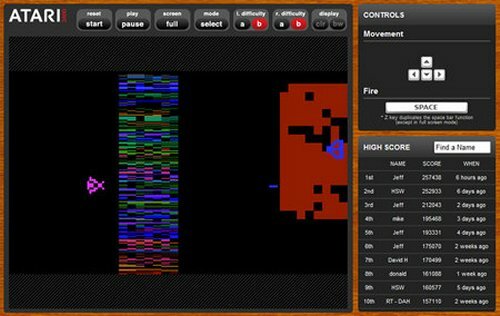 Classic arcade games on their website. Head on over whenever you need to waste time. The site allows you to buy games and also check out new stuff from the Atari Store. Visitors are treated to six awesome retro games, like Asteroids, Adventure, Battlezone, Crystal Castles, Lunar Lander and Yars Revenge. There are even leaderboards to encourage you to get high scores. Back in July we told you about some cool Pac-Man lighters that celebrate the 30th anniversary of the yellow dot-gobbler. But now we have word that there are more awesome designs being offered. 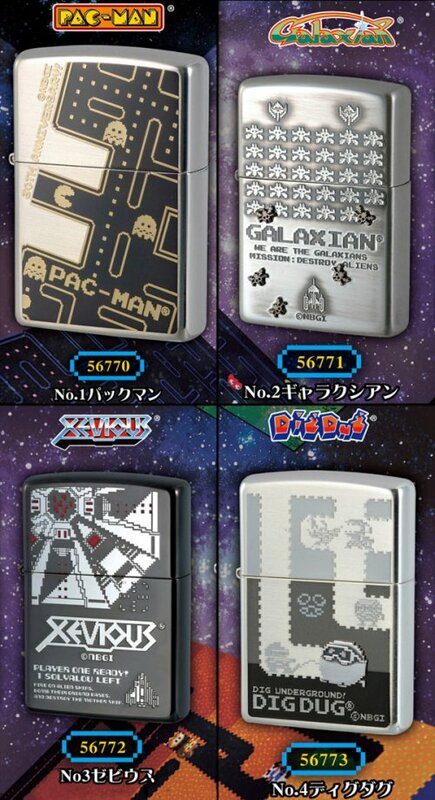 This limited-edition series of Zippo lighters from Banpresto includes shiny, butane-filled versions of Pac-Man,(Which we’ve seen) along with Galaxian, Xevious and Dig Dug. Each features the likeness of the classic 8-bit game. Even if you don’t smoke, you’ll want these awesome collectibles. This game looks much more fun than Foosball. In MaruBot Football League four players control small wireless robots with joysticks. Each of the robots has an actual personality, with LED eyes that display whether they are happy or sad. They are happy when they score a goal and sad if they lose. Why four players? The games makers see MaruBot as being all about “cooperation and partnership, minimizing individualism, isolation, violence of online games.” There’s also a two-player version. It’s a hit in Korea, so maybe one day we will see it here.